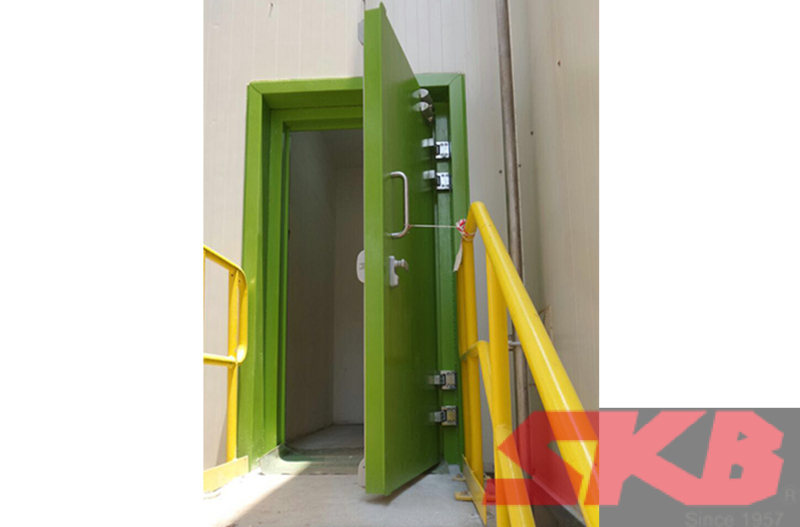 The SKB Blast Resistant Steel Door is custom designed to withstand the blast impact under high-risk high-impact conditions for both interior and exterior environment. This is especially important for industrial labs and warehouses containing explosives and hazardous articles. The solid steel blast resistant door can withstand active pressure up to 30Kn/M2. It is commonly used in military bunker, chemical and pharmaceutical laboratories, research buildings, power stations, ammunition and high risk articles’ warehouses and depot. Door frame – Fabricated from 1st grade high carbon steel C-channel reinforced with solid steel bar. Comes with anti-rust primer on the inside and exterior surface. Installed with a PVC gasket and aluminium frame at perimeter of frame. Door panel – Designed and made with 2 pieces of face sheet minimum of 10mm thickness reinforced with C-channels in between. Comes with anti-rust primer on the inside and exterior surface.